Monster flicker rings were pure 1960's gumball machine magic! Nice score...CONGRATS!! I remember pouring what seemed like, at the time, tons of money into a gumball machine to nab the elusive Phantom flicker ring. I ended up with a disgusting plethora of "Cinderella" rings instead! haha! How discouraging that must have been! I was born in 1973, so I was not around for these the 1st time, but I did grow up loving lenticulars of all sorts, so it's a perfect match. I remember getting Beatles flicker rings as a kid. Man, I wish I still had *those*!!! I've almost by accident accumulated three of the four glasses in the set over the last year or so. My weekly find this week I will never top. A dear, dear friend gave me an amazing birthday present. She and her husband ran a comic book store here in Ohio for years. 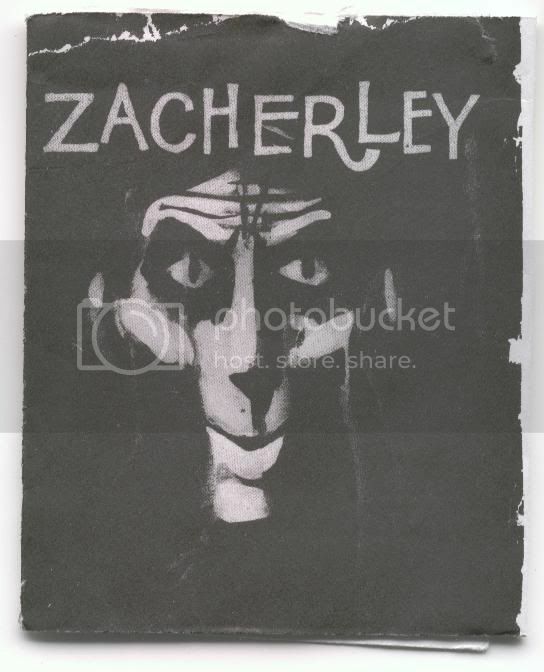 Someone sold him this Molly Hatchett picture disc, signed by all the band members. He in turn sent it to Frank Frazetta the artist who painted the image on the disc, who in turn signed it as well!!! It hung in their store until he passed away in 1999 and she sold the store in 2002. She gave it to me today. It is without a doubt now one of my most prized possessions!! That was a thoughtful and generous gift from your friend. Time to get a record album frame so that you can display it. 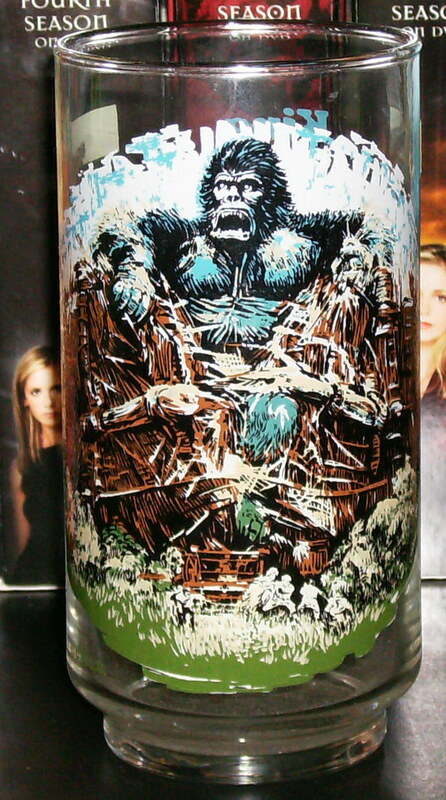 Never saw those Kong glasses before, which is odd. Very nice! Are they hard to find? Amazing Frazetta signature, he rarely signed things, that is really special. 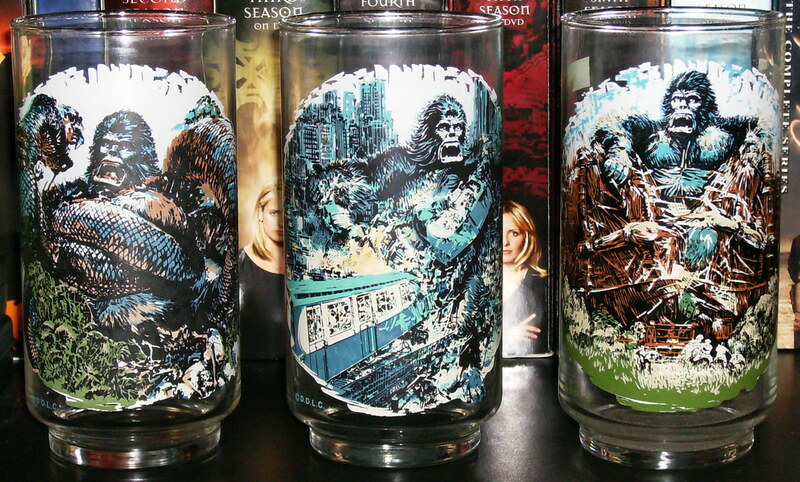 I used to have the Kong glasses! Wish I still did. And the signed picture disc is so awesome! What a great and generous gift! I am sure you also brought her happiness as well in accepting it, as I bet it made her day to see how genuinely pleased you were. Neat item, Mike. Extraordinary piece, Illoman. I was around eleven or twelve years old when the first issue of Creepy hit the shelves. Frazetta's "The Werewolf" blew me away. I'd never seen ink work like that before. For a few months thereafter I signed my drawing attempts in a style inspired by his autograph. Way cool to have the real McCoy! Thanks, DL! By the way to see what DL's talking about click and be amazed!!! GREAT week for monsters! 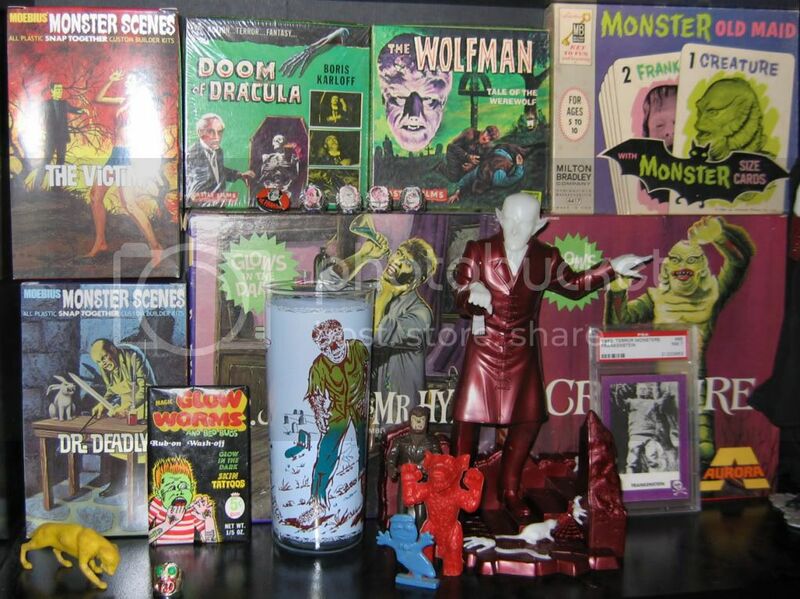 In this pic all but the Models, the card & the Sabretooth Tiger & Boo-Berry(Both mine from childhood) are new this week. And in case they get lost in the picture, this is still blowing my mind! 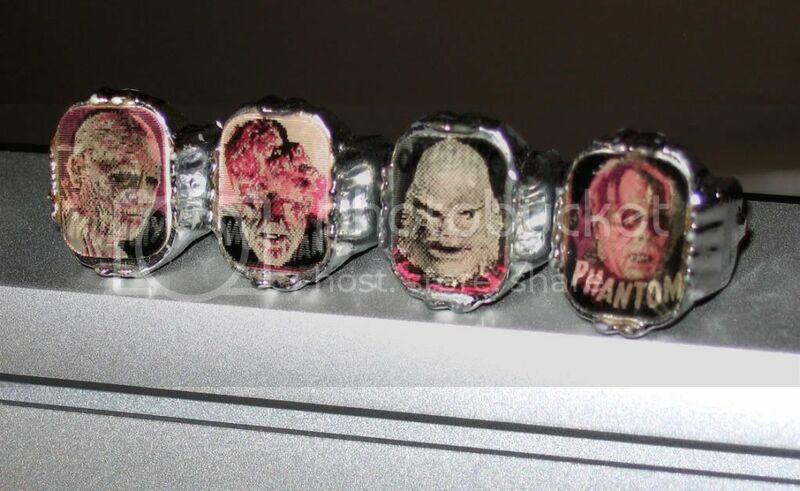 From the same seller I got the phantom ring last week, I worked out a deal for the Creature, Wolfman & Mummy. I just can not believe in 10 days I managed to get 4 of the 6 rings! SooOOOoo Psyched! Man! Complete coolness! What was the final price on these, as I would not mind adding one or two to my collection?